Before the website redesign process. An artist contacted me to redesign his out dated website and add the ability to order online to it. Bruce-art.ca is the result. The website redesign process was to make Bruce-art.ca user friendly. It’s now easy to navigate. It has built in search, related painting suggestions and a currency converter for out of country visitors. It also looks great on a desktop, tablet or on a smartphone. The home page now shows a gallery of the artist’s entire paintings. Visitors to the site can now quickly browse and find any painting they’re interested in. As well, as part of the website redesign process, particular paintings can be quickly found by keyword search or filtered by location or subject matter. Also, the Shop Pages lists all paintings by title and can be sorted on various parameters like price. 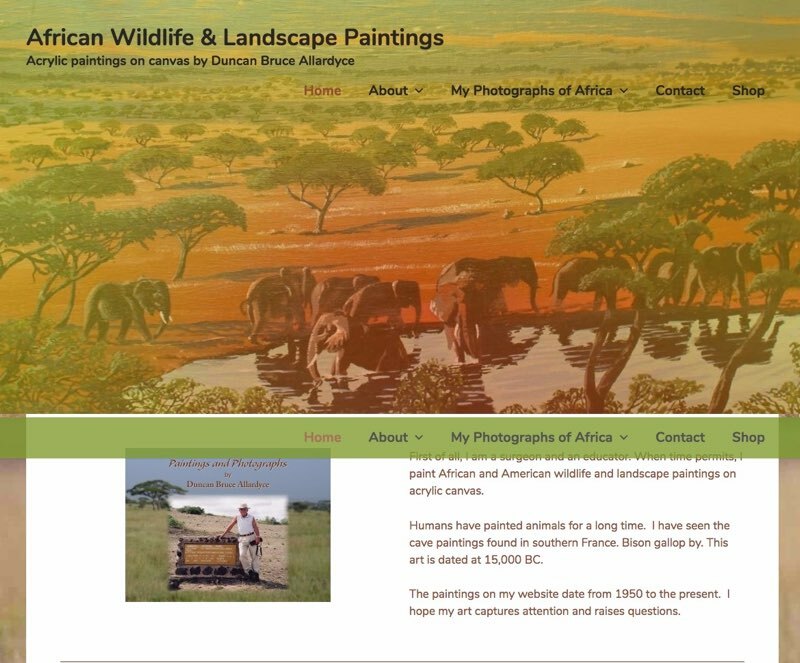 Each painting has an interesting writeup on the wildlife, region or landscape featured on it to educate and engage visitors to this website. The website also has information about the painter. The artist’s background and his childhood interest in Africa that inspires his paintings and photographs, was mentioned, which culminated in his travel to Africa. This lets the visitor know about the sincerity of the artist behind his paintings and photographs and gives the site a human interest element. In redesigning Bruce-art.ca, its challenge was the myriad of shipping and pricing possibilities for buying his paintings. Each painting is a different size. Hence, each painting’s price varies widely depending where it’s shipped to. A flat shipping price by country or even an area was not doable. I therefore modified Woocommerce, which powers Bruce-art.ca’s ecommerce, to give a custom shipping and pricing quote once visitors submits information on where they want their painting shipped to. A Paypal invoice with a custom quote is then emailed to the person to complete payment prior to delivering the painting to them. As seen in the above chart, Bruce-art.ca’s web performance is exceptional. It downloads in less than 3 seconds most of the time, despite 34 paintings, which could slow the website down. Each of the 34 paintings was optimized to minimize this in the redesign. The website was redesigned to look great, be easy to navigate and easy to read on desktop, tablet and smartphone. This is important. Google tends to list websites higher that give a good user experience. It measures a site’s download speed, how long a visitor stay on the website for, looks good on mobile devices, etc. as one of its many factors it considers to rank a website. The website has also been search engine optimized for phrases that visitors would likely enter into Google to look for these types of paintings. 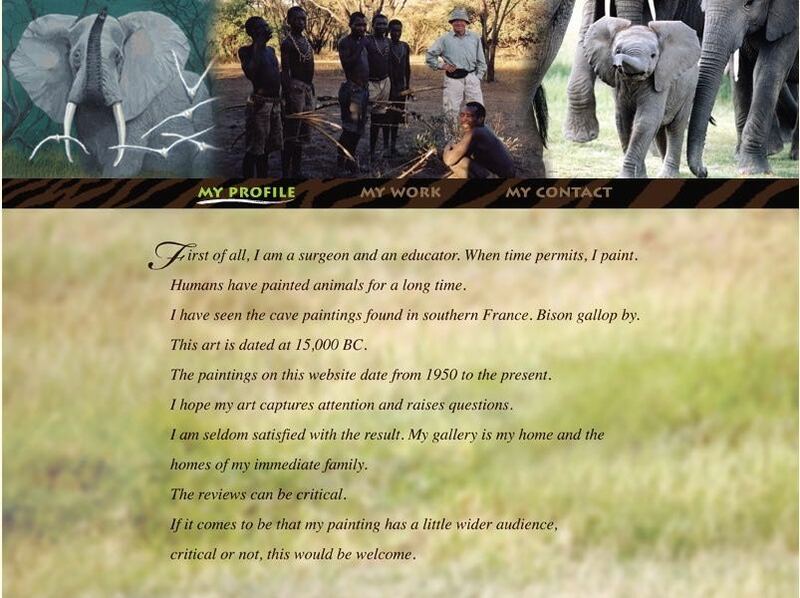 For example, the site was redesigned for search phrases like “African wildlife paintings” or “Elephant paintings”, if looking for elephants in particular. If you would like a second opinion of your website, a redesign of it or design and build a new website for you, like what was done for Bruce-art.ca, please contact me. I would be glad to help. Initial consultation is free.